Starting from Platis Gialos, we cruise towards Syros Island, the gorgeous island in Greece with an outstanding culture, whose capital, Ermoupoli, is also the Cyclades’ capital. With Ermoupoli being characterized as a town-museum, it is no coincidence that Syros in Cyclades, attracts numerous international travelers every year. Ermoupoli: Although the island’s capital Ermoupoli is rather a town than a village with a population of 12.000 people, it deserves to be presented as a place to visit. This wonderful insular city devoted to Ermis, the ancient god of commerce, has it all: a magnificent Town Hall situated on a great square, Miaouli Square, similar to the squares of the modern European cities; a Municipal Library with about 35,000 books; an old aristocrats’ district, Vaporia, with neoclassical houses of unique architecture; the amazing Apollo Theater, a theater with a great history which was designed by Pietro Sampo in 1864 and has been totally renovated; numerous museums and galleries; the first high school ever established in modern Greece, which was established in 1833 and among its students were former prime ministers, famous artists and important personalities in the Greek history; a historic shipyard, Neorio, with a separate part for the construction and repair of wooden ships. What more can visitors ask for? Vari Beach: This organized sandy beach with shallow waters offers everything a family may require: clear and calm waters, thick sand suitable for building sandcastles. Along the beach there are sunbeds and umbrellas and around it there are taverns and cafeterias. Megas Gialos: Megas Gialos is a holiday resort in the southern part of Syros. Its beach is very long, but quite narrow and has tamarisk trees all along it. Megas Gialos is an organized beach with sand and among the interesting things of this beach are the high reeds that stop where the sand begins. And when the sun is about to dive in the horizon, we will settle at Syros. The coming day we will start cruising towards the island of Kythnos. 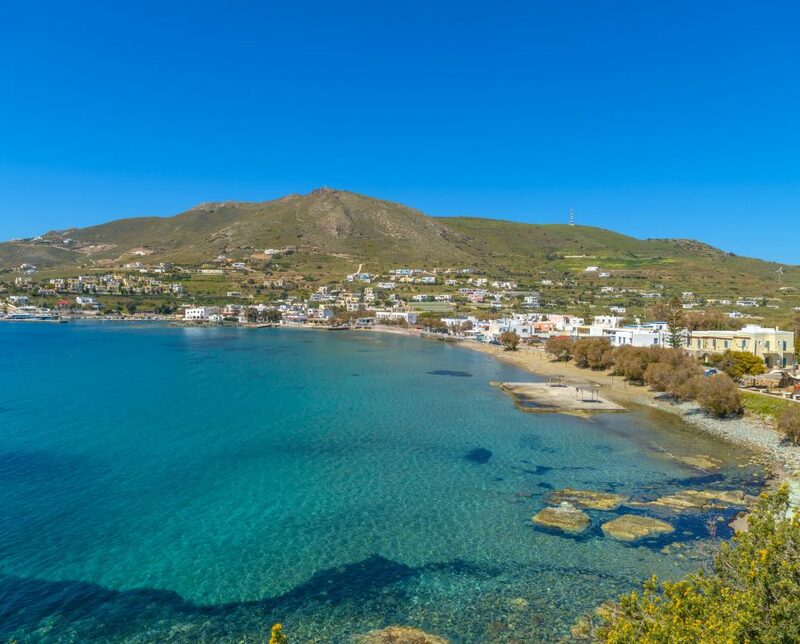 Rightfully considered one of the top weekend destinations in Greece, Kythnos Island in West Cyclades is a heavenly retreat for travelers seeking serenity and peacefulness. The island of Kythnos is renowned for its 70 plus beaches, secluded coves and crystalline emerald waters ideal for snorkeling adventures. Kythnos is an island characterized by its serene atmosphere so travelers should not expect to find an intense nightlife or any big clubs. Kalo Livadi: Kalo Livadi is a quiet beach encircled by pristine hills; it may well be considered as a peaceful heaven of relaxion. The rocky seashore and sandy floor make it ideal for swimming and sunbathing. Swimmers are welcome to enjoy the serenity of the environment and dive into the crystalline sapphire waters while the sound of the waves will most likely be the only sound that disturbs the divine peacefulness. Kanala Beach: Embraced by the pristine nature, Kanala beach is a picturesque beach retreat right in front of the charming village of Kanala. This small pebbled beach offers a serene escape inviting swimmers to dive in the indigo clear waters and bask in the sun or enjoy some shade under the tamarisk trees. There are a few taverns close by offering mouthwatering specialties for visitors to enjoy. Our second night we will stay at Kythnos island. Our next destination is the island of Serifos, a place of natural beauty, nestled in the Aegean. Due to the island’s unique morphology, Serifos beaches will compensate even the most fastidious visitor. Proudly possessing 72 beaches, Serifos provides a wide variety for diversified tastes. Explore the well – hidden ones if retreat is what you seek, or visit the most accessible ones for relaxation.